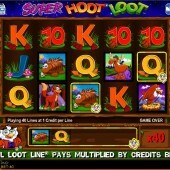 The popular Hoot Loot video slot from online and land-based slot developer IGT has been recreated online under the new name Super Hoot Loot. It is a very similar game, but with a few added extras that give you more winning options. I have had a chance to play the game on various trips overseas. 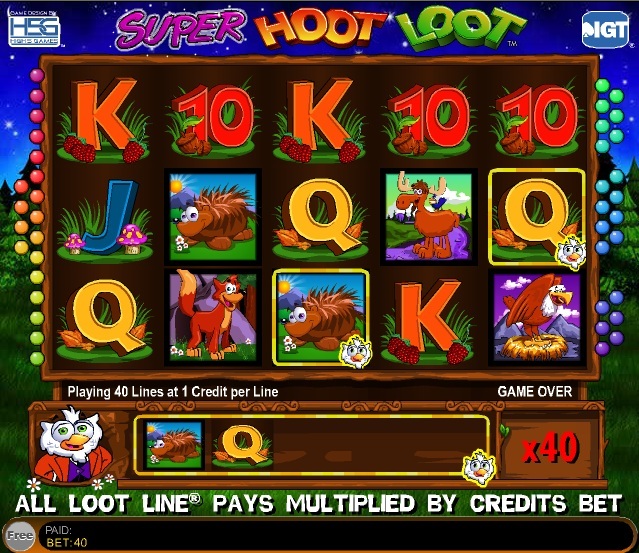 The main focus of the game is character called Hoo the Owl, who acts as a wild symbol and also pop’s up and dances around when you hit a decent win. There are other cartoon characters of the forest in this slot, including Hedgehogs, Foxes, Bears and Bald Eagles. Some of these symbols have a little Hoo the Owl in the corner and can make up extra bonus wins on the Loot Line at the bottom of the game. The bonus round can be triggered by hitting 3 gold safe scatters on reels 1, 3 and 5. This will release 7 free spins and you get a wild fixed on the Loot Line. The scatter safe’s turn green in the free spins and can re-trigger up to 10 free spins if you get 3 on those same reels. For those players that enjoy Hoot Loot then you will probably like Super Hoot Loot as it has more winning options. When IGT slots are available to play online in the US you will also be able to play other favorites such as the cat friendly Kitty Glitter, wolf-themed Wolf Run slot game, and the insect-fest Lil’ Lady slot as well as many more. Personally, I can’t wait for that day.